It's been a couple or three years since I did a Christmas-themed upload. That was because of a lack of "creator's mojo" and lack of any ideas that said "YES! Make me for the sims!!". 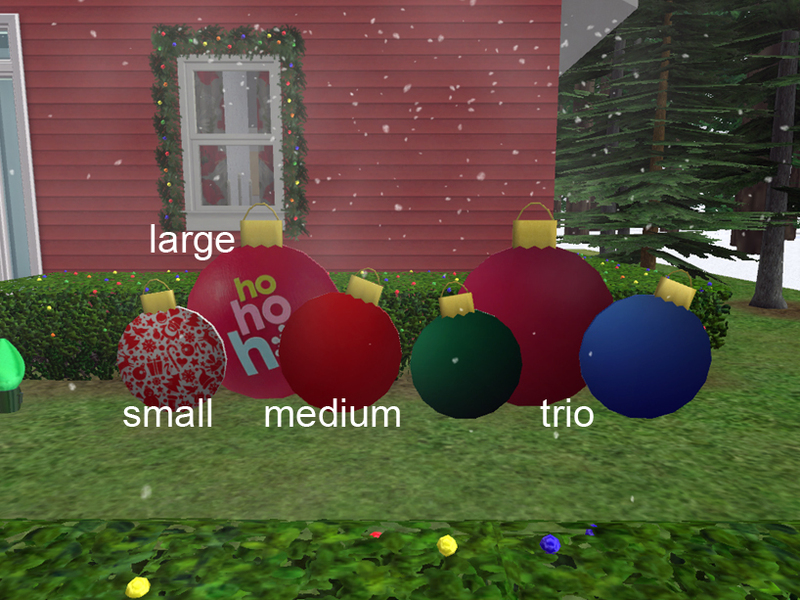 This year I had a bit more luck - my "creator's mojo" is mostly back and I had a couple of ideas rattling around in the wasteland I call my mind..
A set of ornament yard deco - there are 4 meshes: a trio of ornaments, a large ornament, a medium ornament and a small ornament. There are 2 subsets and 9 recolors for mixing and matching. 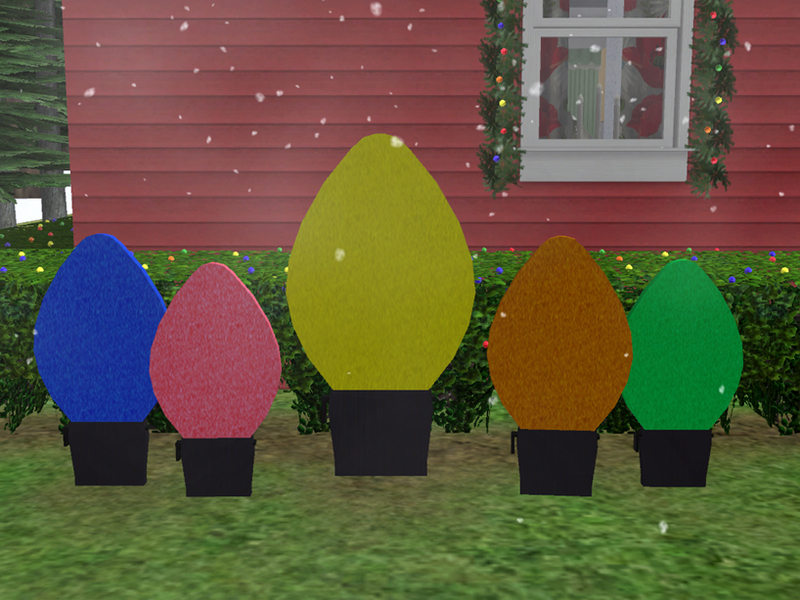 A set of Christmas bulb yard deco - again there are 4 meshes: a trio of bulbs, a large bulb, a medium bulb and a small bulb. There are 2 subsets and 5 recolors for mixing and matching. The sets are repositoried. Each set has the TRIO as the MASTER and is needed for the other sizes to work in your game! 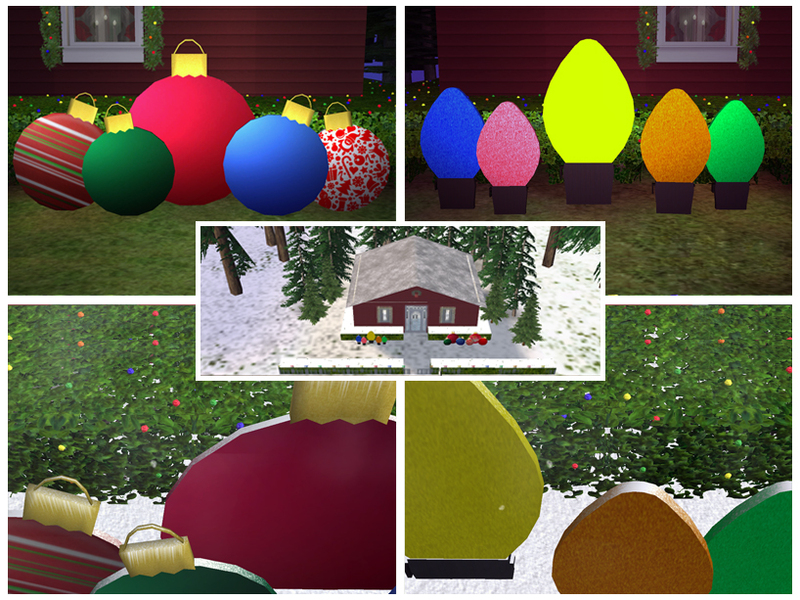 All meshes can be seen in neighborhood view; are kickable by sims; will collect snow on the top of them and have NO shadows since they are meant to be outdoor decorations. There are 3 files in the download. If you download JUST the ornaments, use just that collection file. If you download JUST the bulbs, use that collection file. If you download BOTH sets, use that collection file. 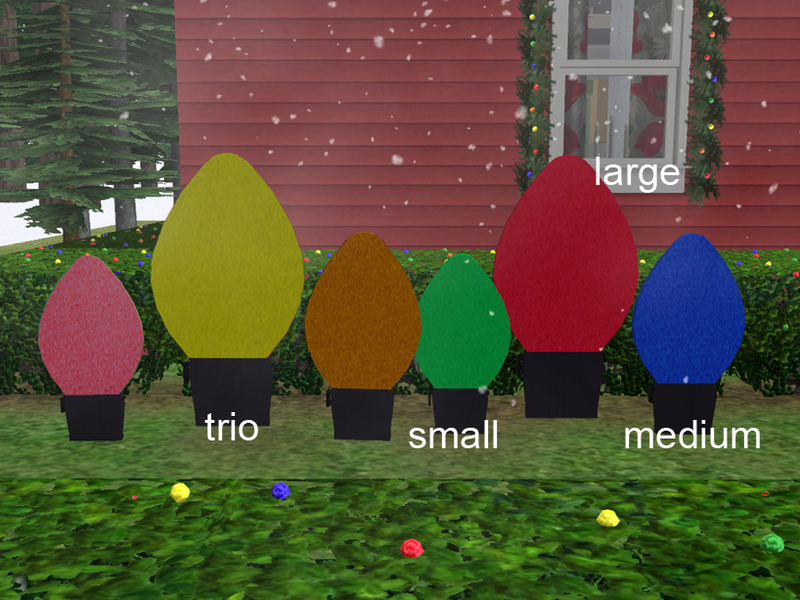 Check the "Related Uploads" tab - My Folksy Christmas set meshes have been updated so they can be seen from neighborhood view! 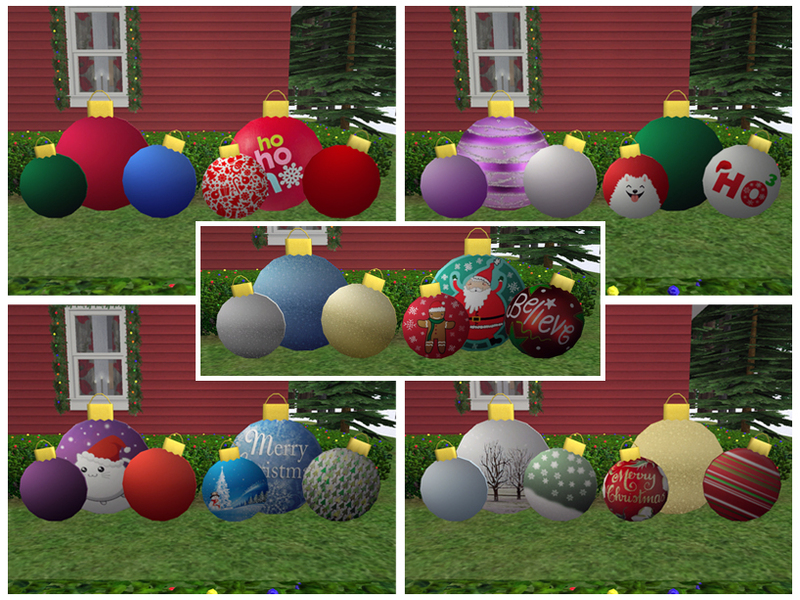 MLC-LawnOrnaments-YardDeco.rar | Description: Ornament meshes and recolors. 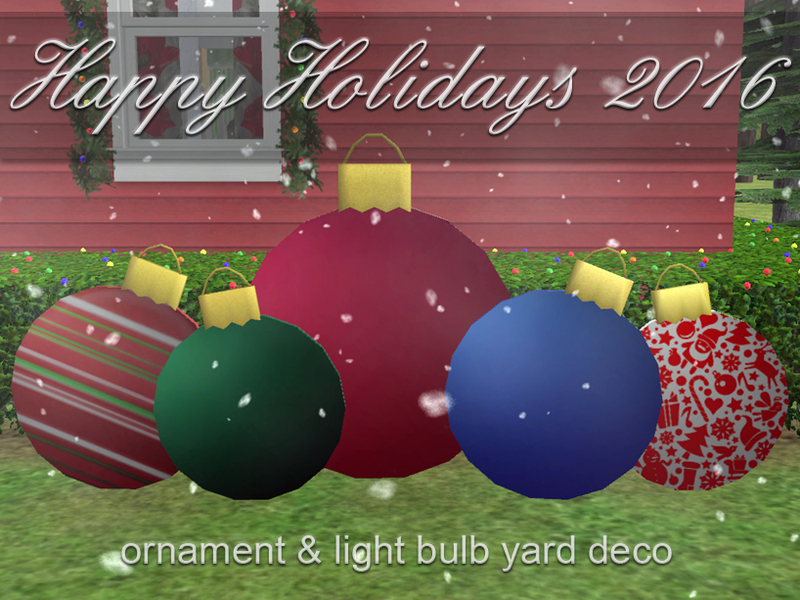 MLC-ChristmasBulbLawnOrnaments-YardDeco.rar | Description: Bulb meshes and recolors. MLC-YardDecoCOLLECTIONS.rar | Description: 3 Collection files - install just ONE!